(Houston, TX)- Forma110 & Artsymex are pleased to announce our Spring exhibition, co-presented with The Mexican Consulate in Houston. Diego and Frida. 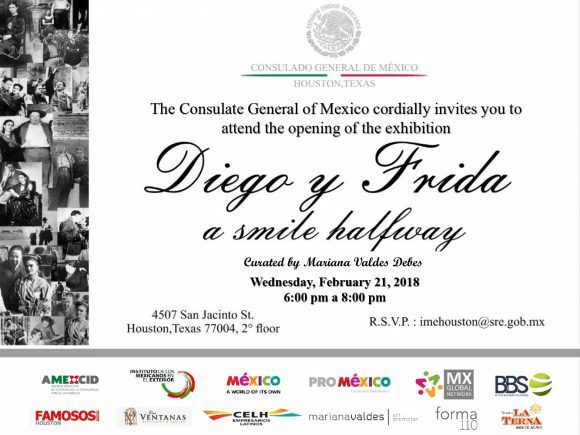 A smile halfway through, was exhibited for the first time in 2002 at the Museo Casa Estudio Diego Rivera and Frida Kahlo of Mexico City, belonging to the National Institute of Fine Arts (INBA); and, at this time, still ascribed to the National Council for Culture and the Arts (CONACULTA); what, since 2015, became the Secretary of Culture of the Federal Government. The exhibition presents the encounters and disagreements of this famous twentieth century couple. However, a new reading allows us to discover also the close relationship that existed between the couple and their photographers: The North American NicKolas Murray (Szeged, Hungary 1892- New York, USA 1965), renowned photographer and contributor to the successful magazines Harper’s Bazar and Vanity Fair, which occupy a very important place in the loving dimension of Frida Kahlo, which is revealed in the photographic action that is perceived in her works. Based on the fact that every work is polysemic, the curatorial adaptation of this exhibition invites the public to enjoy not only the love relationships between Diego and Frida but also to detect the closeness that the couple had with the photographic creators. It is through the photographs of Guillermo Kahlo, Peter Jules, Guillermo Zamora, Nickolas Murray, Edward Weston, Manuel Alvarez Bravo and Juan Guzman among others, that we have testimonies of the private and loving life of the characters.